For a long time, cauliflower was the mushy, uncool cousin to some of the ‘more exciting’ crucifers, like purple sprouting broccoli. I think that this is in part down to overcooking of this crunchy veg, which can lead to a slightly unpalatable smooshy texture and a vaguely indecent aroma. Unless, of course, it’s coated in a creamy rich cheese sauce to make cauliflower cheese. Cauliflower has had a bit of a revival in the last couple of years, thanks to the popularity of cauliflower rice and as an alternative pizza base. But don’t be fooled into thinking this is the only way to enjoy a cauli. Even just cooking it to more of an al dente texture makes it much tastier. It’s also very versatile as a veg as you can add it cooked to curries, stir fries or salads. 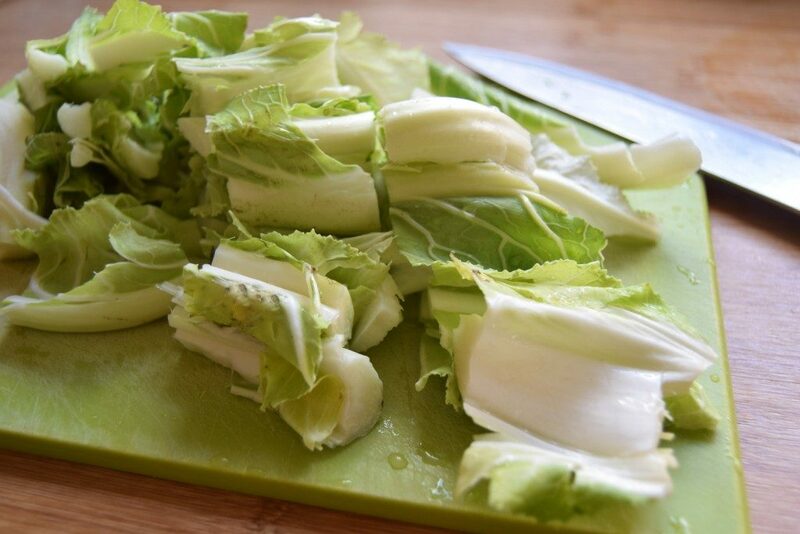 Or chop it into small pieces and add raw to salads with generous amounts of dressing. Now is a lovely time to eat cauliflower as there’s still a little chill in the air and I personally prefer my cauliflower warm. Fortunately cauliflower is a plentiful vegetable that’s often in season (is cauliflower the new black? ), which makes it very good value. You can also go beyond the normal white cauliflower if you’re feeling adventurous. I particularly like what my husband calls alien cauliflower, aka romanesco cauliflower. This is the one with pointy green bits that looks a bit like a triffid. You can even find green or purple cauliflower if you’re very determined. I’m always looking for interesting ways to add lots of colour to dishes and a bit of purple cauliflower is a very good way to do this. As cauliflower doesn’t have a huge amount of natural flavour, it’s a great carrier for spices and other aromatic ingredients. Roasting it brings out a natural nuttiness and gives nice crispy edges to the top of the florets. It’s also surprisingly meaty when you cook up a whole roasted cauliflower (or cut and roast it in ‘steaks’). This makes it a very popular option for vegetarians or vegans, or people who just generally like to eat tasty veg. I’m also not adverse to eating a soothing dish of cauliflower cheese. However I make sure I don’t overcook it and use good quality cheese, plus not so much sauce that the cauliflower drowns. I think perhaps because I didn’t grow up with school dinners (and my mum is a great cook), that I don’t have the nightmare associations that some other people in the UK seem to have when it comes to this dish. I mentioned a few other pairing flavour options in my last post, including zesty lemon juice, warming nutmeg and toasted almonds. Pretty much all spices taste good rubbed into cauliflower, but one of my personal favourites is the combination of ground cumin and cumin seeds, which I’ve included in today’s recipe. 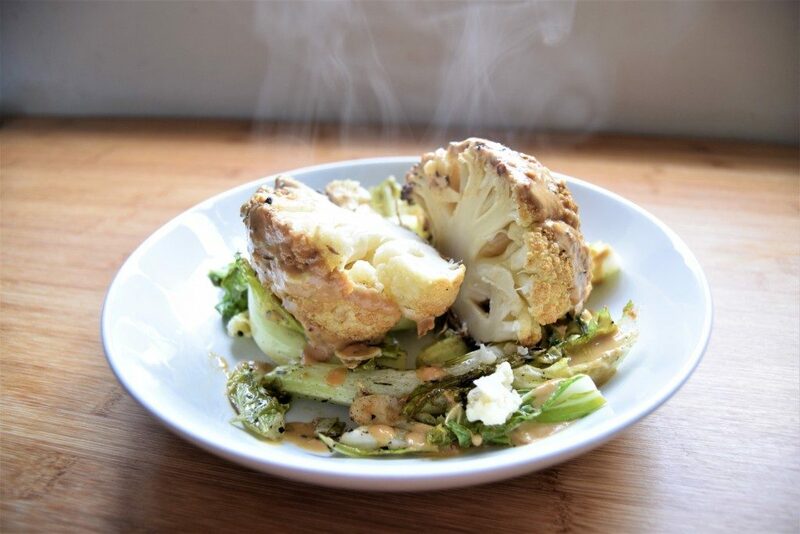 I also love tahini – it’s one of my cupboard staples – and it beautifully matches the nutty roasted cauliflower. 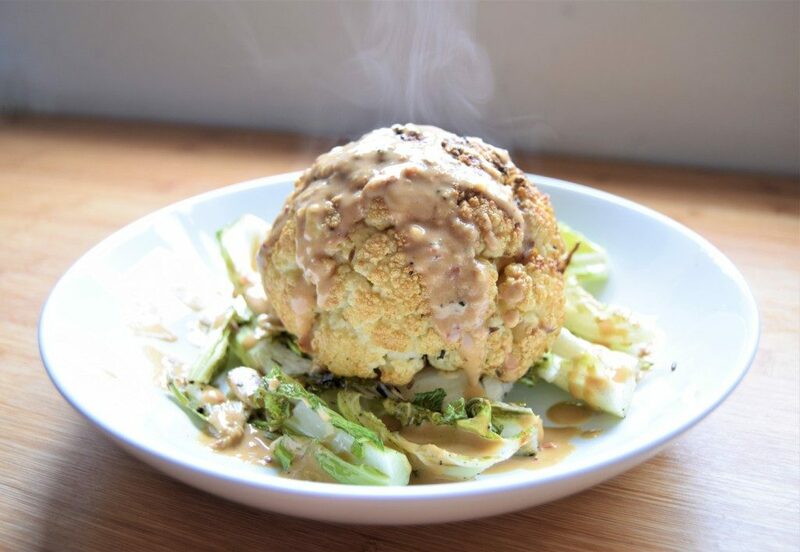 Be generous with the tahini sauce that you drizzle over your whole roasted cauliflower. And don’t throw away the lovely green protective leaves of the outside. 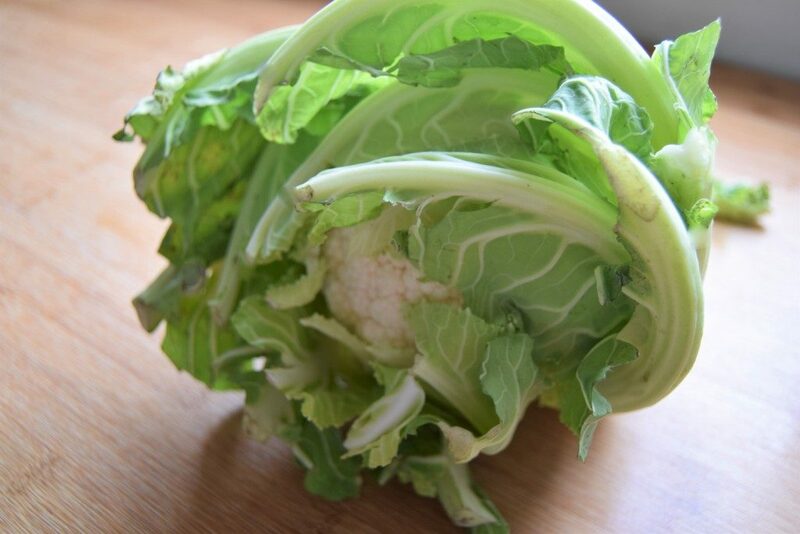 They taste a bit like cabbage and can be used in stir-fries or roasted with the whole cabbage as I’ve done. 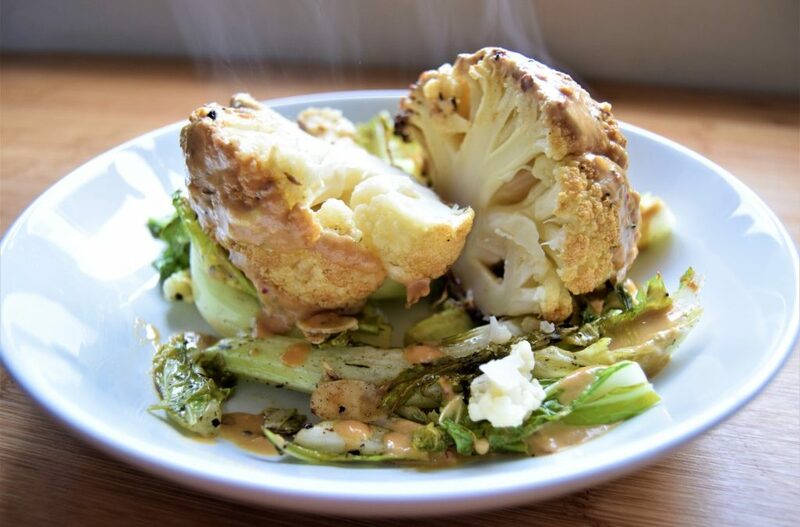 This whole roasted cauliflower would suit 2-4 people as a side or 1-2 people as a main (it’s surprisingly filling). It’s best eaten in a warm dish, with cold wind and grey skies outside, and a happy smile on your face. It’s also delicious the next day chopped up and served in salad. 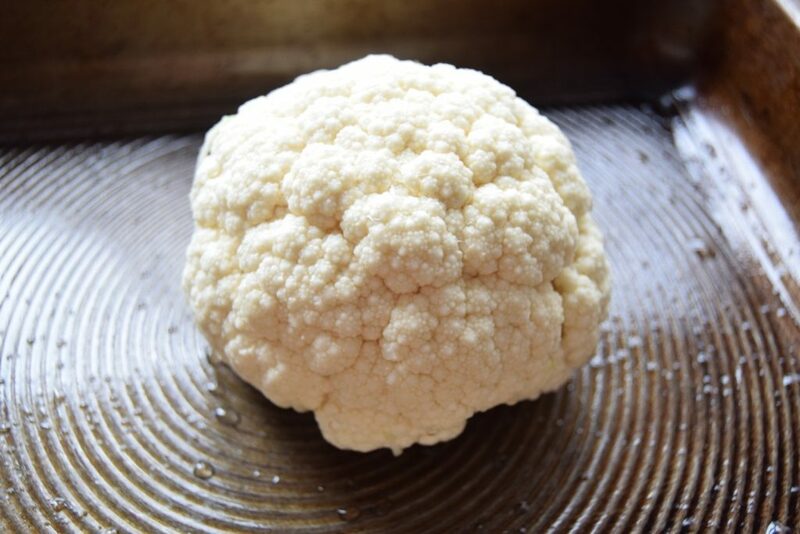 One extra little tip: store your cauliflowers in the fridge upside down to stop condensation and browning on top of the cauliflower head. 1. Pre-heat your oven to 170° C (150° C fan oven). Place the cauliflower head in a roasting tray and sprinkle over the ground cumin, cumin seeds, lemon zest and lemon juice. Give the cauliflower a light massage to work these into the cracks. Pour over the olive oil and give the cauli another little rub. Season with a little good salt and black pepper. 2. Pop the cauliflower tray in the oven on the bottom shelf for 40 minutes. Keep an eye on the cauliflower and if it’s looking a bit brown, give it a little shake and drizzle a bit more olive oil over it. After 40 minutes, open the oven and throw the chopped leaves, almonds and seasoning into the roasting tray, again with a little olive oil. Gently shake the tray so that everything is coated and spread out. Cook for another 10 minutes. 3. While the cauliflower is roasting, make the sauce. Put all the ingredients in a small bowl and whisk together. It should be relatively runny so add a little more juice or water if this is needed to loosen the sauce. It should also taste citrussy so add more lemon juice if you think it needs it. 4. Once the whole cauliflower is lightly golden around the edges and some of the leaves have crisped, remove the tray from the oven. Place the leaves on a round plate, with the whole roasted cauliflower perched top. Drizzle the tahini sauce over the cauliflower so that it drops into the cauliflower and also coats some of the leaves below. my online programme: The Joy Of Eating. The next round is coming soon!